After a couple of months of on and off again work building on what was started by bakercp and others I have had some success in gettingopenFrameworks running on the pcDuino. I am able to compile the openFrameworks library, compile openFrameworks programs and run them. With the steps below you should be able to compile a pcDuino Hello World application similar to the one for the Raspberry Pi. 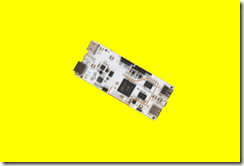 At this point you should see a spinning pcDuino board on a yellow background. I haven't had time for much testing. Besides the Hello World program I have successfully tested several of the examples. I hope to have some time for more testing over the next couple of days.